Better fuel economy than a full size van, costs half as much, lasts twice as long. Don't Laugh. It gets better fuel economy than a pickup truck or full size van, costs half as much, and lasts twice as long. 1. Cost: They're cheap! Typical cost is $4,000-$7,000 (half of that if you shop the auto auctions where the dealers buy them). 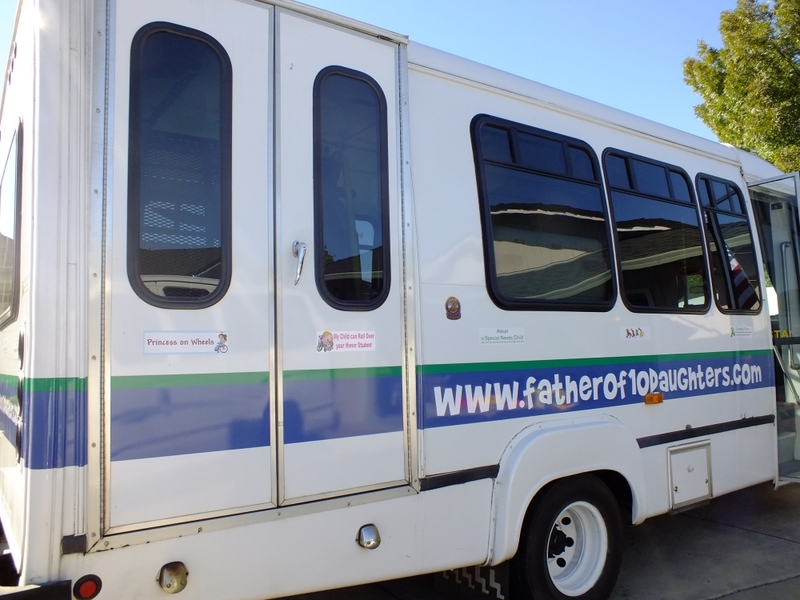 Used wheelchair vans start around $10,000, new ones $40,000 to $80,000. 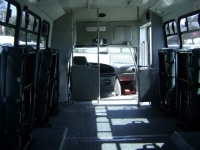 The wheelchair lift alone typically adds $10,000 or more to the cost of a vehicle. On the other hand, you can have your pick of shuttle buses like this for less than the cost of the lift! 2. Fuel economy: No kidding, my bus gets better fuel economy than most full size pickup trucks and vans. It gets 11-12 MPG City and 17 Highway even with most trips under 2 miles and with lots of idling. That's the advantage of a diesel. If you get a gasoline model you can expect considerably lower, about 6-8 MPG. A word about diesel engines: The majority of these shuttle buses were built on a Ford chassis and were availble with two diesel engines. One was one of Ford's best engines, the other one of the worst. The good one, the 7.3L diesel, made by Navistar International, was only made until 2003. In 2004 Ford began making their own diesel engine, the 6.0L, which has a history of problems. Because of that I restricted my search to 1998-2003 shuttles with a 7.3L diesel. 3. Where they come from: The majority were purchased new by a public transit system, the rest by senior care facilities, hotels and airports. When these agencies/facilities are done with them they are usually sold via auto auctions. 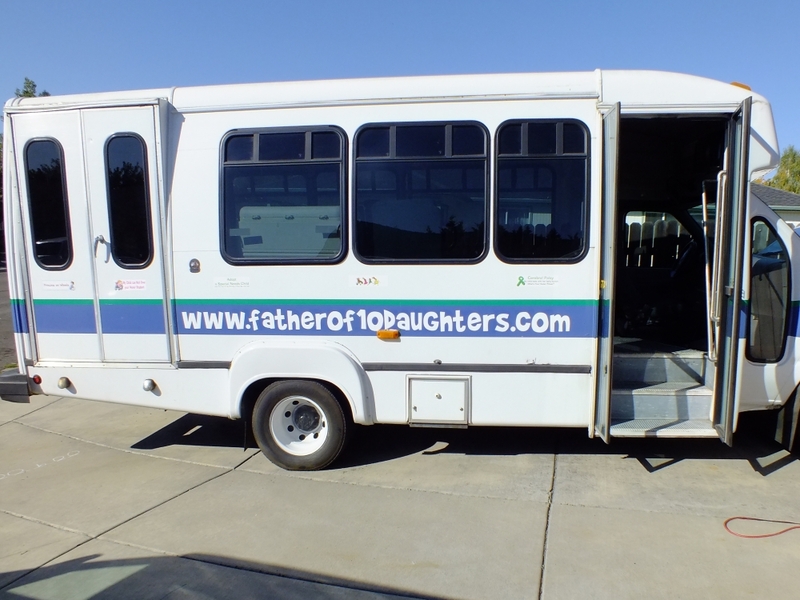 The one I bought, pictured here, was owned by the City of Antioch, California and used as their senior and paratransit bus. From there it was sold at auction and I bought it from the dealer. What's important about this is these vehicles have usually been well maintained and many, like mine, are 1-owner vehicles. 4. They last more than twice as long as a regular van: Most passenger vans are good for about 175,000 miles. These regularly go a half million miles because they're built on a medium duty truck chassis, not a light duty. The 7.3L diesel engine is legendary for going over a half million miles. It means you get more value for your dollar. You're probably thinking that's what you get for your $7,000, one with a half million miles and, although plenty are out there with 300,000 miles or more, there are also plenty with lower miles. The one I bought had 142,000 miles and I looked at some that had as few as 80,000. In other words, my used shuttle bus has more miles left on it han 2 brand new vans! 5. How they drive: Before I bought my shuttle bus I had a regular full size wheelchair van, a 1998 Ford E-150. 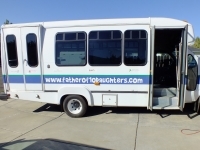 My shuttle bus is a 2000 Ford E-450. The drivers' areas, dash, and seats are virtually identical. It drives the same too. 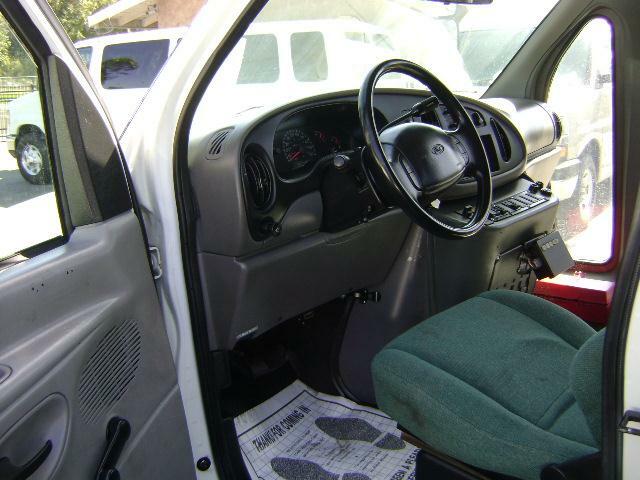 It has cruise control, tilt, power steering, and power brakes, just like any other van. Mine is so easy I can literally drive it with a single finger tip. What is diffferent is it's about a foot and a half wider than a regular van, and acceleration is slower. You can still park it in a regular parking space. It's just tight. Don't expect to be able to go through a fast food drive thru. They're too tall. One thing that will affect how they drive is if it's a "dually" (4 tires on the rear instead of 2). If you get a smaller shuttle that is not a dually expect it to wallow a bit like a boat. I love my dually. It's big but it drives and corners smooth, no wallowing whatsoever. 6. The diaper changing nightmare: In a regular van, both full size and mini, changing diapers on your disabled loved one is bad news. You can't stand up so you risk injury to your back. Even if you could, you don't have room to lay him/her anywhere. Privacy? Forget it. A shuttle bus solves all of that. With 6 and a half feet of head clearance you can walk around freely. 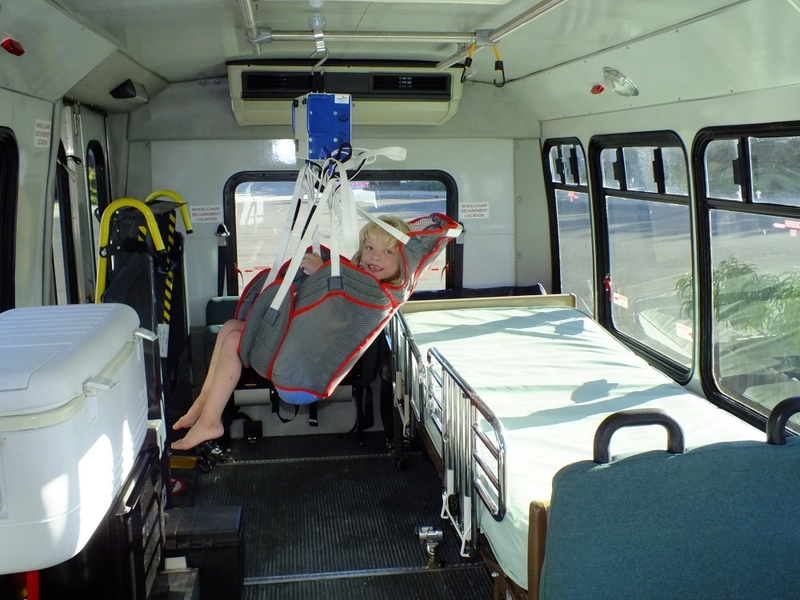 A hospital bed or massage table fits in a shuttle bus easily and does double duty as a bed and a diaper changing station. 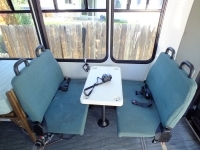 I have room for a hoyer lift but some shuttles, like mine, even have horizontal grab bars mounted on the ceiling that can be used to support a ceiling track motor to lift your loved one out of their chair. 7. Car seat heaven: No more standing in the rain and reaching into your car or van to buckle a young one into a car seat. Instead, you're inside the van standing right in front of the car seat where it's comfortable and dry. 8. Multiple wheelchairs: Don't have need for this? Think again. That hoyer lift (or other equipment) I just mentioned; it is easily secured in a 2nd wheelchair position. If you look closely at the photo with the seats tipped up you'll see my shuttle bus is designed to transport 5 wheelchairs. The layout of the L-track is something to consider when buying. 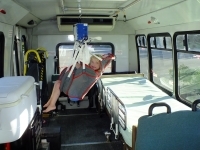 Securing a hospital bed in a moving vehicle would normally be a problem but the extra wheelchair positions made it easy. I just used a set of wheelchair tie downs to hook onto the bed's frame and it was instantly secure. 9. 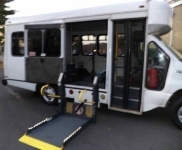 High end wheelchair lifts and tie downs: Typically, shuttle buses are purchased by public transit systems so they come with high end wheelchair lifts rated at 800 pounds. Mine had a "toolbox" in the back and when I opened it I found 5 complete sets of Qstraint deluxe self-retracting tie downs, complete with shoulder straps and extra L-track hardware. 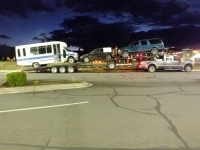 All totaled, the stuff in the toolbox had a value of over $2,000 and the former owner, a public transit system, just left it there in the box when they replaced the vehicle. Tie downs are a necessary part of a wheelchair van. If they come with the purchase price it sweetens the deal considerably. 10. Transport: If you're interested in a shuttle bus you'll probably look nation wide or at least regionally. There are plenty to choose from, just not all in your home town. Except in the rare event you buy locally you're going to have to get your new bus home. You can drive it home yourself but, if you need to have it transported, be aware that this can easily cost $1,500 due to the size and weight of the vehicle. If you do drive it home be aware that many of these vehicles have been on the dealers' lots for a year or more and the batteries may be in bad shape. In other words it wouldn't be a bad idea to have the batteries checked and/or replaced and make sure you have towing insurance in place before you make that thousand mile drive home. 11. 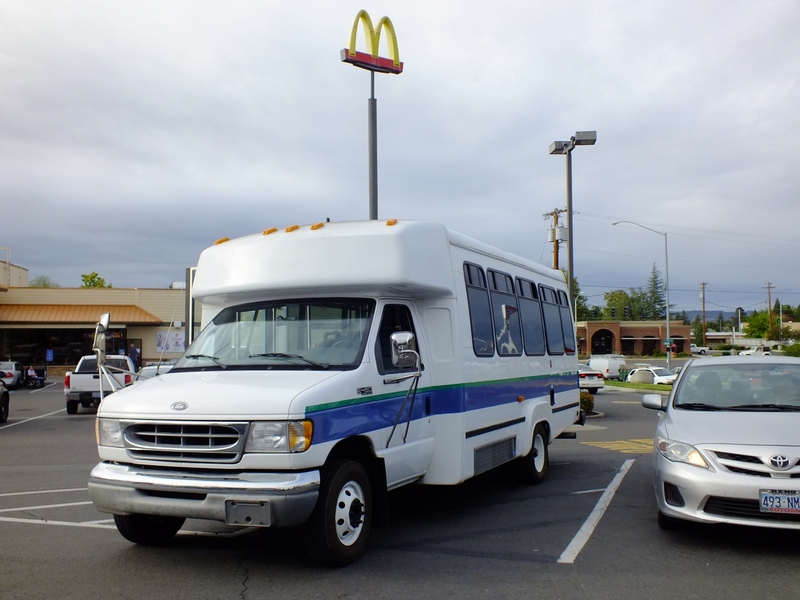 E-350 vs E-450: Most full size wheelchair vans are Fords and shuttle buses are no exception. They come with various weight load ratings, half ton (E-150), 3/4 ton (E-250), one ton (E-350), and ton and a half (E-450). 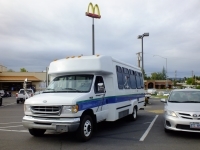 A 15 passenger van is typically an E-350 and shuttle buses E-350 or E-450. The E-350 is usually not a "dually" and will tend to wallow whereas the E-450 is quite stable. The E-450 comes with dual batteries, not a bad idea when starting that diesel motor on cold winter mornings. The E-350 will have a lower gross vehicle weight, hence lower registration fees and slightly higher fuel economy. The E-450 is a medium duty truck so it's more durable and has a longer life span. The E-450 has a 55 gallon fuel tank, almost double that of the E-350. For me, the E-450 was a clear winner over the E-350. 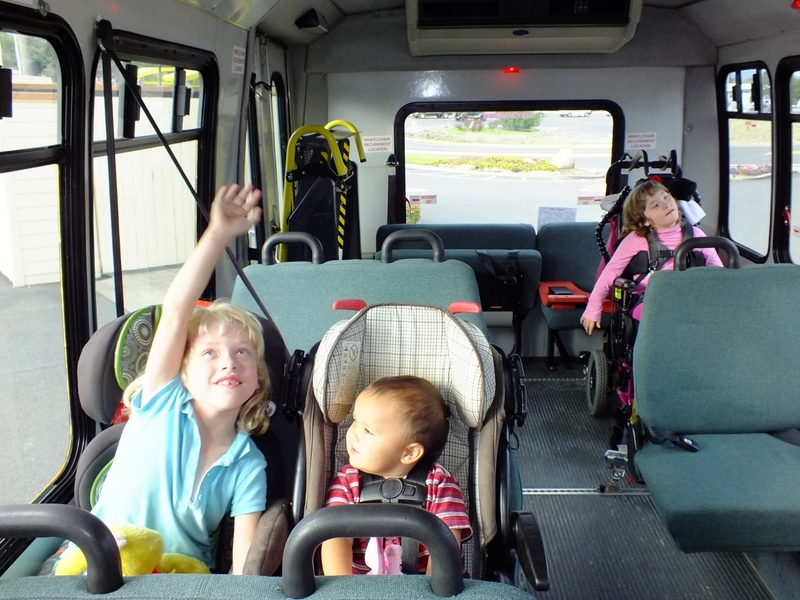 12: CDLs: Some shuttle buses require a Commercial Drivers License (CDL). It varies from state to state but, in my state, a CDL is required if the vehicle has seats for more than 15 people or the gross vehicle weight (GVW) is more than 26,000 pounds. Most shuttle buses are in the 10,000 range so weight is usually not an issue. Too many seats? Take a few out; problem solved. 13: Registration: Shuttle buses are heavy so you're going to have to pay more to register it with your state's DMV. You might want to check the fees before you buy. They can get quite high in some states. 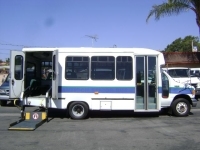 Most shuttle buses have a GVW in the 10,000 pound range. Consider making a few modifications and registering it as a motor home. In many states the fees are far less. 14. Insurance: My shuttle bus costs no more to insure than my regular full size van, even with full coverage. Just be sure to clarify with your agent that it's for personal use only and that it has a wheelchair lift. 15. Fun: Your kids are going to love it! My 7-year-old was even giving tours of her bus to the other kids in the neighborhood. Take it camping. Where else can you find a motor home with a wheelchair lift for under $7,000? Total strangers will smile and wave at you. You're going to love it. 16. Towing: I tow an enormous triple axle travel trailer with ease and it doesn't even require a load leveling hitch. A backup camera system is almost essential. It makes parking a lot easier and you won't be backing over a child. I got one from Costco that's designed for large vehicles like this for $199. It comes with a 7 inch screen, night vision, a microphone, and the ability to handle 3 cameras. You can even put one inside the bus. Cup Holders: So they're not exactly like regular full size Ford vans. The area of the dash where they put the cup holders has usually been replaced by switches that operate the door and wheelchair lift. Decals: Your bus is a traveling billboard. 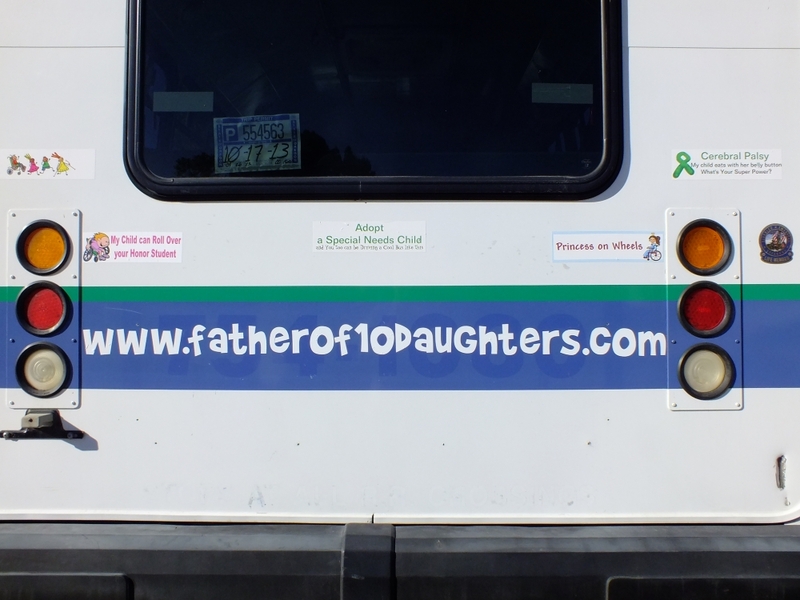 Why not use it to promote the cause of the disabled with a few decals and/or bumper stickers or how about vinyl lettering with the name of your web site or blog? 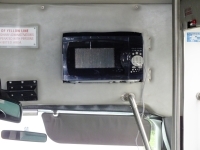 Auxiliary heat: If your bus doesn't have rear heat (or even if it does) you might want to consider an additional source of heat. I already had an indoor rated portable propane heater for camping so, instead of collecting dust during the winter, I put it to use in my bus. What I like most about it is I can heat the bus without running the engine. There's nothing like coming back to a warm bus after being out on a cold day. Just make sure your propane heater is rated for indoor use. Tip: Unless you live in a mild climate I'd get a heater rated at least 15,000 BTUs. 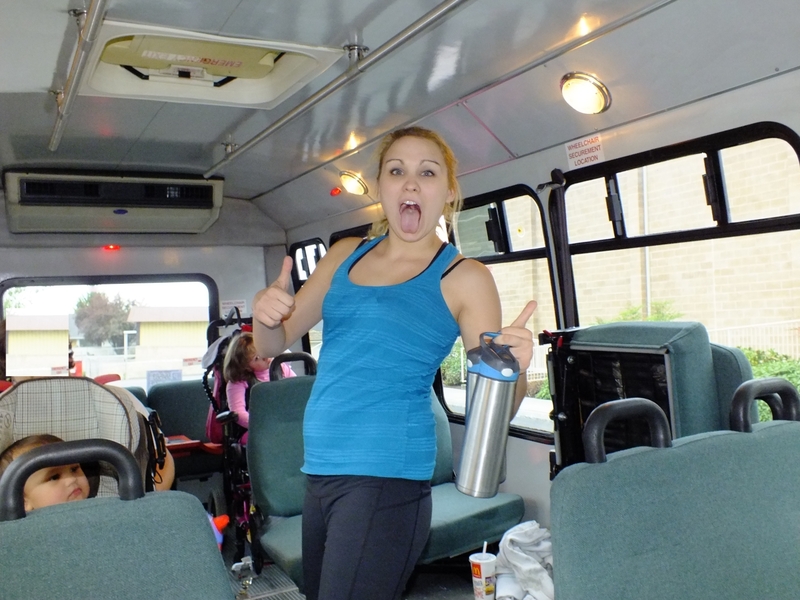 Tip: Put a carbon monoxide alarm in the bus. They're cheap and readily available because they're required for most homes now. 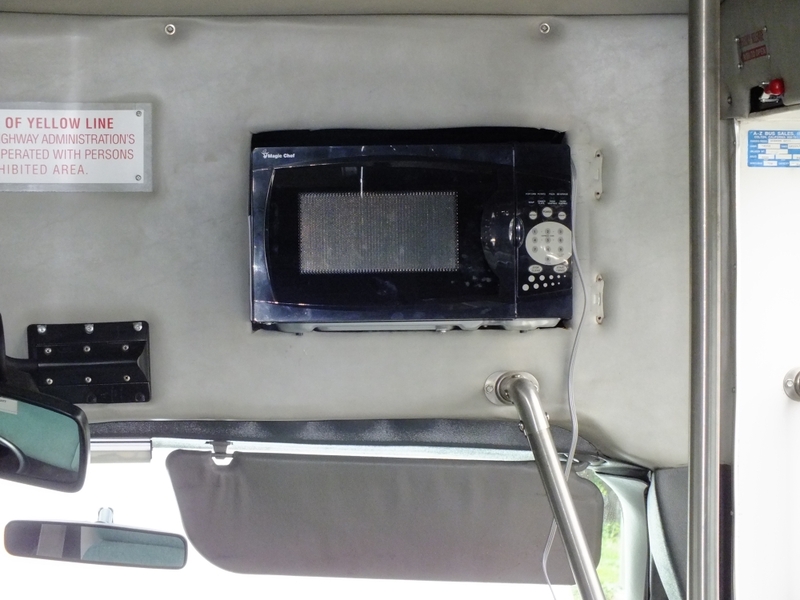 Radio/receiver: Many shuttle buses have nothing but a basic radio, not even a CD. It's something you'll probably want to upgrade. Extra power outlets: With the only cigarette lighter ports being on the dash, your passengers will constantly be running cords from the rear seats to charge their smart phones, iPods, tablets, etc., creating annoying trip hazards. I solved the problem for $10 by purchasing a dual power outlet with 2 USB ports and installing it over the passenger seats. Remount the seats so they face each other and add a table: It's easy to do and it makes travelling a whole lot more fun for your passengers. Regrigerator and microwave: You've got the room so why not? 18. Where to find them: During my search I found Craigslist and eBay to be my best resources. Although they're listed in numerous other places I found the sellers had almost always listed their ads on Craigslist too because it's free. The only problem with Craigslist is it has is a seprate web site for each city or region. However, there are 3rd party web sites such as ZoomTheList that can do national or state searches on Craigslist. For search words I found "wheelchair diesel" worked best. You can search for words like shuttle, minibus, bus, and van but you'll get a lot of hits that aren't relevant. If you have months to look, consider car auctions. It's a lot more work but you'll pay about half as much. Fold up seats: The bench seats in my shuttle bus can tip up out of the way when not in use. 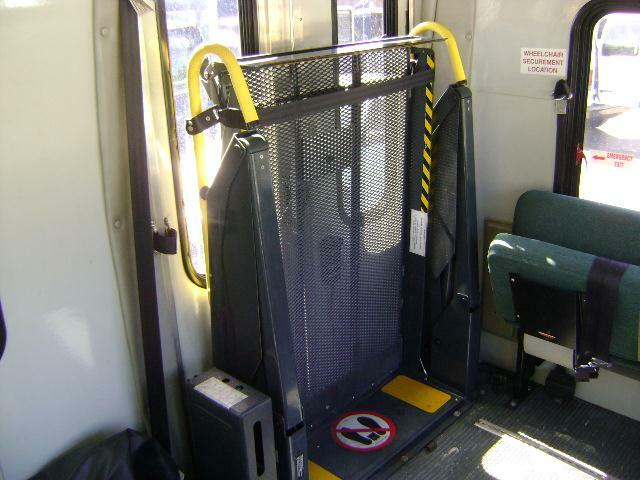 This offers a lot of flexibility while still maintaing the ability to transport a lot of people and/or wheelchairs. Not all buses have this feature. Ceiling grab rails: If you want to add a ceiling lift system this is a must. A related issue is the height of the ceiling. If you're planning to use a ceiling lift or hoyer lift be sure to make sure you have adequate height. Rust: This is where a CARFAX or similar VIN history report is worth far more than its cost. Knowing where the vehicle has been will help you avoid hidden rust. I specifically avoided rust belt states. Why settle for a vehicle with rust when plenty are availble from states without rust? Same thing goes for states where there have been recent floods. Front & Rear Air: A shuttle bus has a lot of volume to cool. Front and rear air is a must. Not all rear air units are the same. They vary considerbly in cooling capacity. 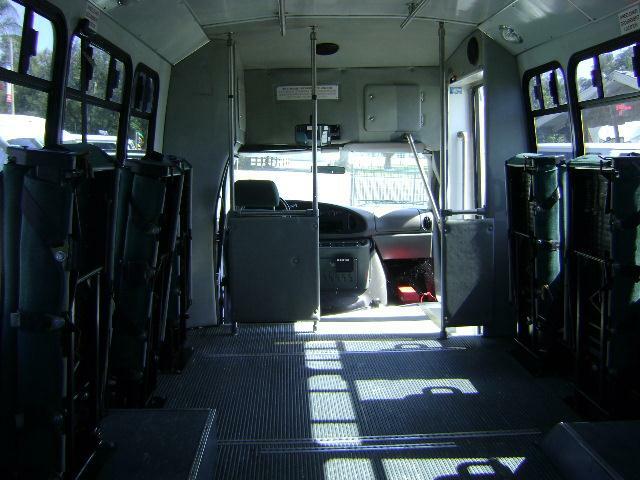 Rear Door: Most shuttle buses have a large window in the back. A few have a door. It's a nice feature but the trade off is you lose the rear row seating. Flat floor: It was around 2001/2002 they did away with the humps over the rear wheels. The advantage is a floor that is flat througout the entire bus. The disadvantage is the floor is higher resulting in slightly less head clearance. Mine is a 2000 and has the humps over the rear tires. It doesn't bother me a bit. 20. 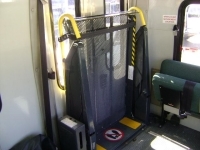 Front vs Rear wheelchair lift: Shuttle buses come with the lift either in front of or behind the rear axle. I believe the rear configuration to be better for two reasons. 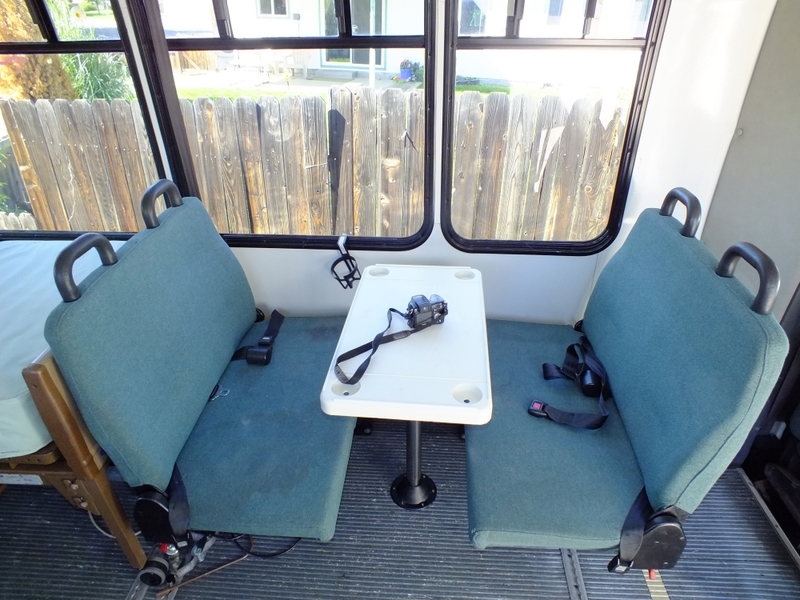 1) Greater seating flexibility: The front lift takes out prime seating area. 2) Other vehicles don't block the lift: Maybe the wheelchair loading zone is too narrow or someone parks next to your vehicle. Either way other vehicles blocking access to the wheelchair lift is a common problem. With the lift in the rear you can usually drop the lift behind the other vehicle. You don't even need a loading zone. 21. The downside: As the size of the vehicle grows, so does the cost per repair, especially diesels. Registration fees are more too although, in many states, it's not as bad if you register your vehicle as a motor home. Keep it in perspective, however. It gets better fuel economy than a full size van, costs half as much, and lasts twice as long so your overall cost is actually lower. 22. My only regret: Large family, small family, wheelchair or not, my only regret is I didn't buy one of these decades ago.